Activision boss Bobby "What, Me Worry?" 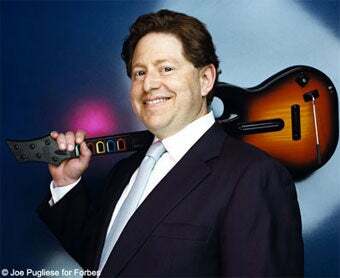 Kotick is hot stuff right now, and in Bobby's world, it doesn't get much hotter than appearing on the cover of Forbes, wielding a plastic guitar like a battleaxe. Backing up that cover pic is, of course, a lengthy article on the man. Profiling the rise and rise of the corporate rock star, Forbes writer Peter C. Beller does a fine job of telling Kotick's story. How Activision is his baby, how it's rolling in cash, how Viacom were going to have to wrest control of that baby from his cold, clammy dead hands. But then we get to this bit. EA also teamed with MTV to sell Rock Band, a shameless knockoff of Guitar Hero that added drums, bass and a microphone to the world of make-believe rock stars. Probably shouldn't believe every line Activision PR feeds you there, Pete.